Participating as a vendor at the Northwest Yoga Conference is an exciting opportunity to unite our love for yoga and our businesses with our community! As a vendor at the Northwest Yoga Conference, you will be able to build brand awareness and name recognition, directly connecting with your target market audience in an intimate and personal setting. We are expecting between 1,000+ conference attendees from Washington, Oregon, Idaho and British Columbia as well as throughout the United States and Canada. In addition, the Yoga Marketplace is open to the community class attendees. Through the marketplace, Northwest Yoga Conference strives to connect yogis with companies and products that will enhance and compliment the lifestyle of the Northwest yogi. To provide optimal connection between yogis and businesses, our marketplace is intimately-sized at 20-25 vendor spaces. 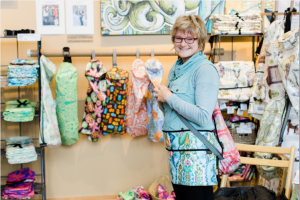 We strive to include a diverse selection of vendors including those making local and hand-made products. Vendor spaces are approximately 8’x4′ and includes a 6’x30″ table. The fee is $800. * Inclusion in the Marketplace Mingle – attendees visit vendors throughout the weekend with a stamp card for a chance to win prizes! Hours are subject to change at the discretion of the Northwest Yoga Conference Director. Location: Washington State Convention Center, Seattle, WA. Due to the intimate size of the marketplace and the desire to ensure a diverse offering of vendors, we cannot guarantee placement in the marketplace to all applicants. To maximize your potential of being selected, please submit your application as soon as possible. We review applications on a rolling basis. If you are selected as a vendor, you will have 7 days to submit payment (check only) and company logo. If after 7 days, payment and logo are not submitted, we will no longer hold your space in the marketplace and it may be offered to another applicant. Ready to submit your application? Click here.